This article is about the drink. For the Irish corporate tax avoidance structure called single malt, see Double Irish arrangement. Single malt whisky is malt whisky from a single distillery. Single malts are typically associated with single malt Scotch, though they are also produced in various other countries. Under the United Kingdom's Scotch Whisky Regulations, a "Single Malt Scotch Whisky" must be made exclusively from malted barley (although the addition of E150A caramel colouring is allowed), must be distilled using pot stills at a single distillery, and must be aged for at least three years in oak casks of a capacity not exceeding 700 litres (150 imperial gallons; 180 US gallons). While the Scotch model is usually copied internationally, these constraints may not apply to whisky marketed as "single malt" that is produced elsewhere. For example, there is no definition of the term "single" with relation to whisky in the law of the United States, and some American whiskey advertised as "single malt whisky" is produced from malted rye rather than malted barley. All single malt goes through a similar batch production process, as outlined below. There are several types of single malts available from distilleries including single barrel single malts which are the product of a single batch that was stored for three or more years in a single oak barrel. These single barrel variants afford the opportunity for the consumer to see the influence of different types of storage on the same whisky (e.g., first use bourbon whiskey barrels, port pipes, etc.). The more common form of Single Malt is a marrying at bottling time of various batches that are mixed or vatted to achieve consistent flavours from one bottling run to the next. Water is first added to the barley to promote germination. At a later stage, prior to fermentation, it is mixed with ground barley grist to create a mash. Water is also used later in the production process to dilute most whisky before maturation, and added once again before bottling. Most new-make malt whisky is diluted to about 60% alcohol by volume (ABV) or so before it is placed in casks to mature (62.5% is specified as a maximum in U.S. law for making straight whisky). The aged spirit is then diluted with water to reduce it to bottling strength (typically 40-50% ABV). Since large amounts of water are used during the process of whisky production, water supplies are a key factor for the location of any distillery. Malting floor at Highland Park Distillery. Barley, yeast and water are the only ingredients required in the production of (barley-based) single malt whisky. The barley used to make the whisky is "malted" by soaking the grain in water for two to three days and allowing it to germinate. This process releases enzymes, which convert unfermentable starch (which is insoluble in water and not available for fermentation by yeast) to fermentable sugars. 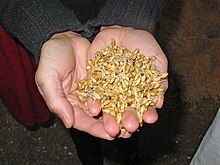 Traditionally in Scotland each distillery had its own malting floor where the germinating seeds were regularly turned. The "pagoda roof" (many now false) which ventilated the malt kiln can still be seen at many distilleries both in Scotland and in other countries. However, most of the distilleries now use commercial "maltsters" to prepare their malt. The germination is halted (by heating) after three to five days, when the optimum amount of starch has been converted to fermentable sugars. The method for drying the germinated barley is by heating it with hot air. The distinctive "pagoda" chimney of a kiln at a distillery in Scotland. In most cases, some level of smoke from a peat-heated fire is introduced to the kiln to add phenols, a smoky aroma and flavour to the whisky. Some of the more intensely smoky malts have phenol levels between 25 and 50 parts per million (ppm). Islay malts have a reputation for being the most peaty. More subtle malts can have phenol levels of around 2–3 ppm. Entirely non-smoked (non-peated, unpeated) malts are made by the Glengoyne Distillery, which only uses hot air for drying. The extraction is done in a large kettle (usually made of stainless steel) called a mash tun. At first, the hot water dissolves the sugars (maltose) and enzymes (diastase) in the grist. Then the enzymes act on the starch left over from the malting stage, continuing the conversion to sugar, and producing a sugary liquid called wort. Typically, each batch of grist is mashed three times or so to extract all the fermentable sugars. The first water is injected at approximately 60 °C, the second portion at approximately 72 °C and the third and final portion at approximately 88 °C. The wort from the first two water courses is drained into "washback" vessels for further processing, whereas the third course is retained as the first charge in the next batch. Yeast is used to ferment malted barley in washbacks. Yeast is added to the wort in a large vessel (often tens of thousands of litres) called a washback. Washbacks are commonly made of Oregon Pine or stainless steel. The yeast feeds on the sugars, and as a by-product, produces both carbon dioxide and alcohol. This process is called fermentation and can take up to three days to complete. When complete, the liquid has an alcohol content of 5 to 7% by volume, and is now known as wash. Up until this point the process has been quite similar to the production of beer. The wash, 5%–7% ethanol, is distilled in copper pot stills, boosting the alcohol content to 60%–80%. Scottish regulations require single malts to be distilled in pot stills. In other jurisdictions, column stills may be used. The initial distilled spirit produced by a pot still, known as low wine has an alcohol content of about 20 to 40%. The low wines are then pumped into a second still, known as the spirit still, and distilled a second (and sometimes a third) time. The final spirit, called "new make spirit", generally has an alcohol content of 60 to 70%. Most new-make malt whisky is diluted to about 62.5% a.b.v. before it is placed in casks to mature. The "new-make spirit", or unaged whisky, is then placed in oak casks to mature. By law, all Scotch whisky must be aged for a minimum of three years in oak casks, though many single malts are matured for much longer. The whisky continues to develop and change as it spends time in the wood, and maturation periods of twenty years or more are not uncommon. During the time it spends in the wood, a significant percentage of each cask's content will evaporate. The lost product is known as the angel's share. Sherry casks are also commonly used. This practice arose because sherry used to be shipped to Britain from Spain in the cask rather than having been bottled, and the casks were expensive to return empty and were unwanted by the sherry cellars. In addition to imparting the flavours of their former contents, sherry casks lend maturing spirit a heavier body and a deep amber and sometimes reddish colour. Stainless steel shipping containers, however, have reduced the supply of wooden sherry casks, to the extent that the Macallan Distillery builds casks and leases them to the sherry cellars in Spain for a time, then has them shipped back to Scotland. Other casks used include those that formerly held port wine, madeira, rum or cognac. To be called a single malt whisky in Scotland, a bottle may only contain whisky distilled from malted barley and produced at a single distillery. The regulations of other countries may allow malted rye. If the bottle is the product of malt whiskies produced at more than one distillery, the whisky is called a blended malt or vatted malt, or pure malt. If a single malt is mixed with grain whisky, the result is a blended whisky. Single malts can be bottled by the distillery that produced them or by an independent bottler. The age statement on a bottle of single malt whisky is the age of the youngest malt in the mix, as commonly the whiskies of several years are mixed in a vat to create a more consistent house style. On occasion, the product of a single cask of whisky is bottled without being vatted with other casks, and released as a "Single Cask" offering. However, it is not always clear what the term "single cask" refers to. At least some producers release vattings of multiple barrels that have been matured together for one final period in a larger single cask as "single cask" whisky. While cask-strength, or undiluted, whisky (sometimes having an alcohol content upwards of 60%) has recently become popular, the vast majority of whisky is diluted to its "bottling strength" - between 40% and 46% ABV - and bottled for sale. Whisky can be "chill filtered": chilled to precipitate out fatty acid esters and then filtered to remove them. Most whiskies are bottled this way, unless specified as unchillfiltered or non chill filtered. Unchillfiltered whisky will often turn cloudy when stored at cool temperatures or when cool water is added to them, and this is perfectly normal. Unchillfiltered, cask-strength whisky is generally regarded as whisky in its purest form. Unlike wine, whisky does not continue to mature in the bottle. E150A caramel colouring may be added to single malt Scotch whisky prior to bottling, to give the whisky a more rich and well-aged appearance. No other additives are allowed in Scotch whisky. This contrasts with the rules governing Canadian whisky production, which allow the addition of other flavourings as well as caramel, and with the rules governing American whiskey, which do not allow additives in "straight" whisky. The use of the caramel additive must be disclosed when the whisky is sold in some jurisdictions, although not in Scotland itself. Distillation of whisky has been performed in Scotland and Ireland for centuries. The first written record of whisky comes from Ireland in 1405 in the Irish Annals of Clonmacnoise, where it was written that the head of a clan died after “taking a surfeit of aqua vitae” at Christmas. The production of whisky from malted barley is first mentioned in Scotland in an entry on the 1494 Exchequer Rolls: "Eight bolls of malt to Friar John Cor, by order of the King, wherewith to make 'aqua vitae'". Single malt whisky is associated with the Scottish tradition, although there are also Irish single malts and others. Penderyn, the only whisky commercially produced in Wales, is also a single malt. From the 15th century onwards, whisky was heavily taxed in Scotland, to the point that most of the spirit was produced illegally. However, in 1823, Parliament passed an act making commercial distillation much more profitable, while imposing punishments on landowners when unlicensed distilleries were found on their properties. George Smith was the first person to take out a licence for a distillery under the new law, founding the Glenlivet Distillery in 1824. In the 1830s, Aeneas Coffey refined a design originally created by Robert Stein for continuous stills which produced whisky much more efficiently than the traditional pot stills. Quickly, merchants began blending the malt whisky with the grain whisky distilled in the continuous stills, making the first blended Scotch whisky. The blended whisky proved quite successful, less expensive to produce than malt with more flavour and character than grain. The combination allowed the single malt producers to expand their operations as the blended whisky was more popular on the international market. ^ The Scotch Whisky Regulations 2009, The National Archives, 2009. ^ The Scotch Whisky Regulations 2009: Guidance for Producers and Bottlers Archived 2010-07-05 at the Wayback Machine, Scotch Whisky Association, February 12, 2009. ^ "Glendronach Confusion (or What is a "Single Cask"?)". Retrieved 11 July 2014. McFarland, Ben; Sandham, Tom (8 November 2013). "Thinking Drinkers: a beginner's guide to single malt whisky". The Daily Telegraph (London). Retrieved 27 May 2014.